first off, thanks for all of the love for elena’s cardigan! it’s funny how you sometimes don’t really get what something is looking like until you do the finishing. pre-finishing, i thought it was cute – but with post finishing – adorable. sweet. the perfect shades of green. oh la. i highly recommend the pattern. 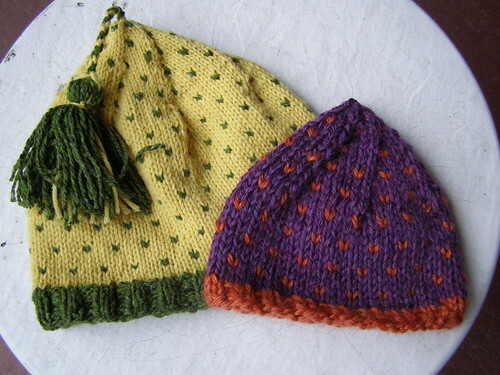 cascade 220 and kathmandu aran – 18 mo.-4 yr.
and Spindling on the 18th. the new lamb’s pride superwash bulky – 0-6 mo. hope the new year brings you bright new things. and, selfishly, i hope this whole teaching thing works out! i’m nervous and excited all at once – and i think i tell you that about something once a week. ha! 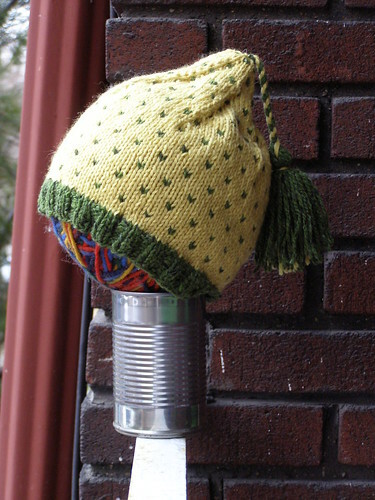 This entry was posted in colorwork, cosyknitsliterally, hats, knitting, teaching by cosymakes. Bookmark the permalink. Good luck with the teaching. I really hope it works out for you. Oh, and that purple sweet potato is too cute for words. I’ve been wanting to knit a sweater using that particular kind of colorwork. It amuses me to no end that it is sometimes called the Norwegian Lice Pattern! Just found your blog, love what you make! Good luck with the teaching gigs! I hope 2009 makes you happy and makes you fulfilled.